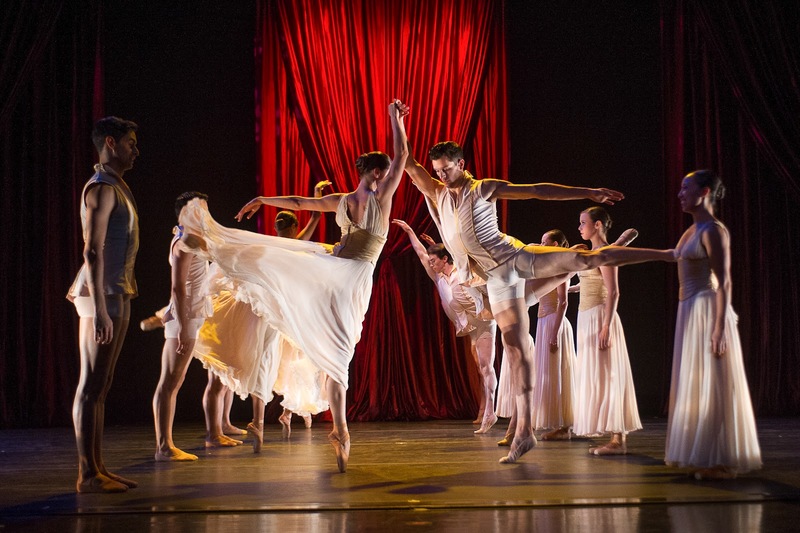 Jacob’s Pillow ended its 80th season with the historical and dynamic Joffrey Ballet. The choice of this renowned Chicago-based company shows Jacob’s Pillow’s expertise in selecting and exposing audiences to eclectic, thought-provoking dance groups. The history between the Pillow and The Joffrey goes back over 50 years, starting with appearances by Robert Joffrey, the company’s founder. During this special engagement, East Coast audiences experience this talented company in their first appearance back at the Jacob in 47 years. The program consists of three works showcasing the varied repertory of the company and its dancers. The first piece, "Age of Innocence," choreographed by Edward Liang, takes a look at females in Victorian Era society as depicted in the novels of Jane Austen. Through the use of traditional English social dances, the ballet shows the repression of Victorian society over the women and relationships between women and men. This constraint contrasts with beautiful moments of partnered dancing, which exemplify the passion and love which lies beneath the surface. The ballet proves the dancers’ wonderful lines, musicality and balance. The choreography works with the music by Philip Glass and Thomas Newman in a creative way, especially in the timing. "Bells," the second work, is choreographed by Yuri Possokhov. It is lighter work filled with stylistic flair. The variations on costumes and lighting help convey the expansiveness of the piece, as does the music by Rachmaninov. The third work, "Son of Chamber Symphony," is a Jacob’s Pillow World Premiere choreographed by Stanton Welch. With great athleticism the male This work shows dancers focus on leaps and turns. The lone ballerina evokes images of a music box dancer caught in a chaotic world. This intriguing work, with its sweeping music by John Adams, concludes the performance. The evening was enthusiastically applauded by the audience, ending a successful summer season at Jacob’s Pillow.